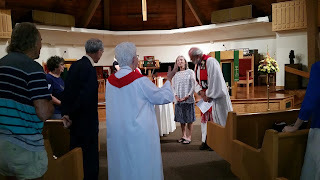 On August 1st, 2015, Mary Mother of Jesus Inclusive Catholic Community celebrated liturgy with Pastor Phil Garrison and his wife Patricia. 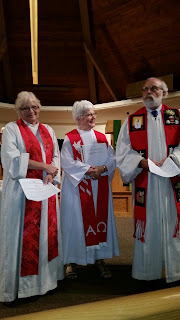 Women Priests: Kathryn Shea, ARCWP and Sally Brochu, ARCWP co-presided. We gave thanks for Pastor Phil Garrison, who welcomed us to St. Andrew UCC in 2009 and offered us a sacred space that we now call our spiritual home in Sarasota among God's faithful people where love in action is a daily experience of living Gospel inclusion, hospitality and justice. 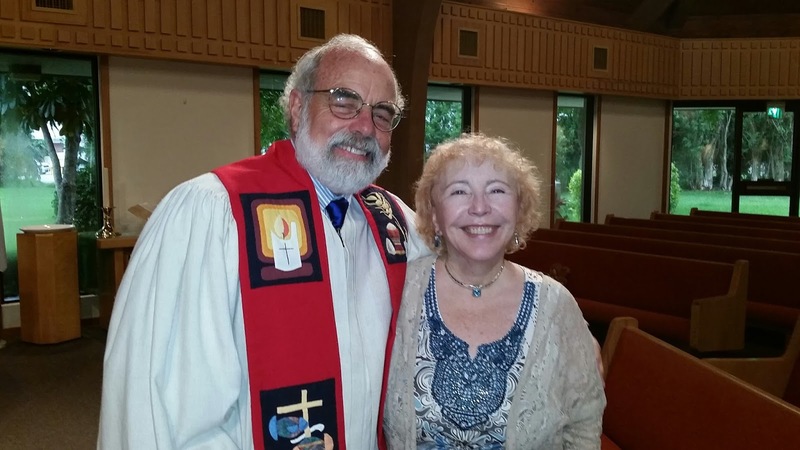 Pastor Phil and Patricia are leaving St. Andrew UCC for a new assignment in Michigan. We are deeply grateful for their spiritual leadership and pastoral support of our Mary Mother of Jesus Inclusive Catholic Community. At. St. Andrew UCC, we have been given wings to fly and flourish! 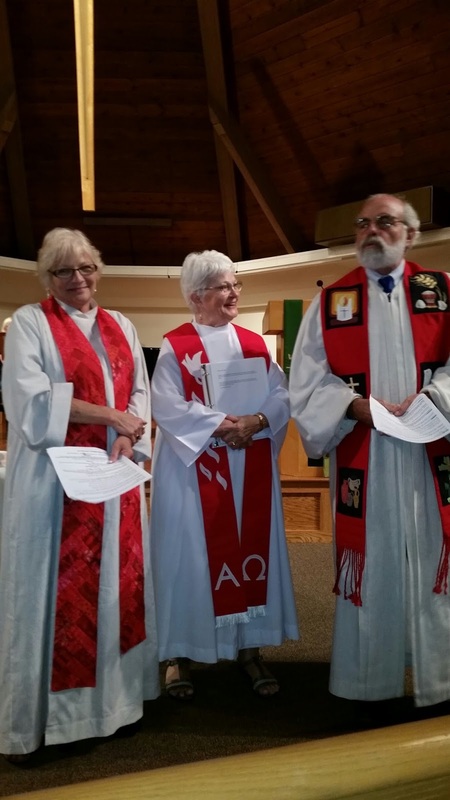 Deep appreciation to Pastor Phil and St. Andrew UCC for their witness to Gospel equality! Today, we also gathered to inter the ashes of our dear Sister, Carol Ann Breyer, who died in September 2014 in St. Andrew Memorial Garden. 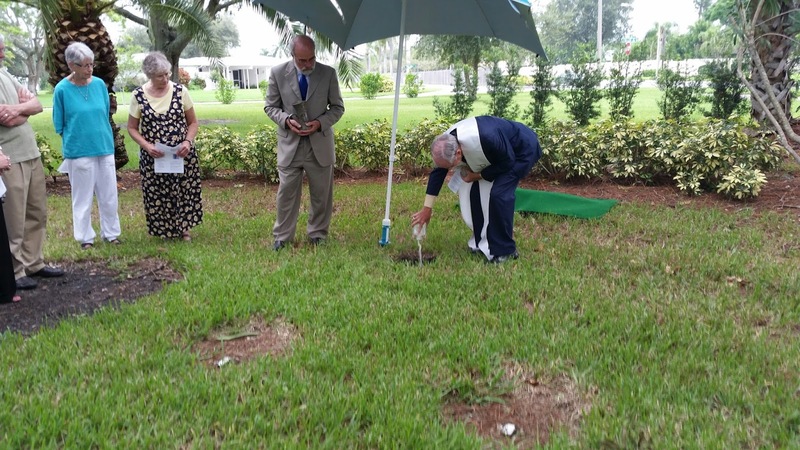 St. Andrew UCC Leadership Council have recently approved the burial of ashes of our community members in this sacred and blessed garden. Carol Ann is the first member of our community to be buried here. Pastor Phil co-presided with Lee Breyer, Carol Ann's beloved husband at our prayerful tribute and goodbye to our beloved Sister, Carol Ann. 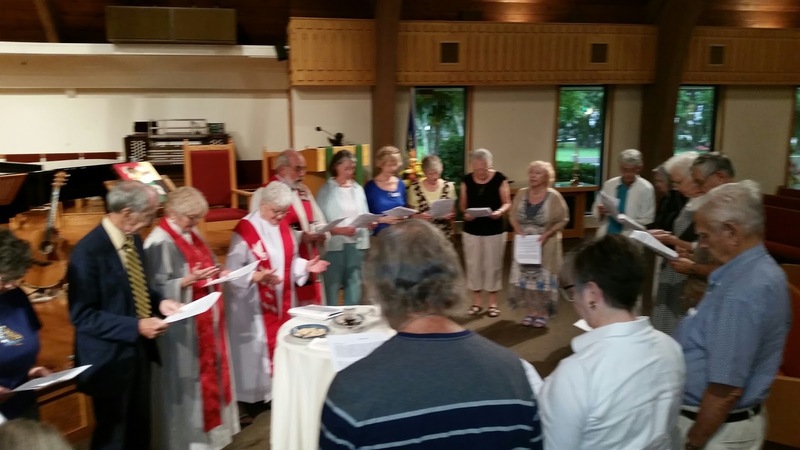 The community shared their fond memories and expressed deep appreciation for her passionate witness to justice and equality in our church and world. While reflecting on today’s Readings, several themes or thoughts came to me. The first, being the importance of bread. The word “bread” is mentioned 360 times in the Bible; 280 in the Old Testament and 80 in the New Testament. In the Old Testament, as we see in our reading from Exodus today, the people were worried about not having enough food to eat and worried Moses led them to starve in the wilderness. So God made bread rain down upon them so they could be fed. In our Gospel Reading, the people followed Jesus wondering when he arrived in Capernaum. Jesus responds to them (and he’s sort of a feisty Jesus here), confronting them, challenging them, saying, they really weren’t there looking for signs that Jesus was the Messiah, but wondering when they were going to get their next meal. He tells them they should not be working for “perishable food,” that food will not last long. They should be looking for life-giving food that lasts for all eternity. This is the food he can give them as the Chosen One sent by Abba God. In John 4, Verse 31, the disciples are urging Jesus to eat, but Jesus told them, “I have food to eat that you know nothing about.” We say in The Prayer of Jesus, “Give us this day our daily bread.” Are we praying for physical bread, spiritual bread, or both? So “bread” has both a literal meaning and a symbolic meaning in the Bible. So the second sort of message here is that we need not be focused of the material things of this Earth, they are all temporary and we cannot take them with us. In the second Reading we are told “we must stop living in the kind of life the world lives.” “You must put aside your old self, which is being corrupted by the following illusory desires.” Just look at the world around us. We are being consumed by materialism and for many they can never have a big enough house, a new enough car, enough money in the back. Or as we watched in horror and disgust this week, we need one more animal trophy head to mount on our wall, the head of a magnificent and majestic lion; a creature of God. All of this materialism, while millions go hungry. And the third theme is a lack of Faith and a belief in the Chosen One. There was a lack of Faith by the people of Israel that God would provide food for their physical survival. In the Gospel Reading, the people lacked faith. They asked for a sign so they could believe in Him. They asked what they must do to perform the works of God. The answer is pretty simple: “to believe in the One whom God has sent.” They again ask for more bread, and Jesus again says “I Am the Bread of life”, spiritual survival. So in this crazy world we live in, how do we stay “spiritually full?” How often do we turn to Jesus only when we need something? And how often do we come to Jesus just to be in relationship with him so that our soul can be fed? What keeps us anchored in knowing that the overwhelming love of Jesus rises like the bread and bakes within us so that we may never be hungry or thirsty? And finally, our dear Seth could not be here with us today, and we all know he is the perpetual co-presider. And you all know if he was here, he would be taking the microphone about now. I read him the Readings and my homily starter and asked him what he thought and if there was anything he wanted to add. Of course he did. His words: “What the HECK? Why do people have a hard time believing and KNOWING Jesus? I don’t get it. It’s so easy!” AMEN! Presider: In the name of God, our Creator, of Christ, our liberator, and of the Holy Spirit, our Sanctifier. ALL: through his living, dying and rising, Jesus has revealed that nothing can separate us from the infinite love of God, May God give us pardon and peace, and may we forgive each other our failures to care for one another and our earth in the name of God our Creator, and of Jesus, our brother, and of the Holy Spirit, our wisdom. Amen. ALL: and peace to God’s people on earth. God, our Creator, Liberator and Sanctifier, we worship you, we give you thanks, we praise you for your glory. Jesus, Child of God, Healer God, Teacher God, you free us to live in your love. You make us strong; you show us your mercy and love. You are one with the Creator, you hear our prayer. You are the Holy One. You are united with us. You are our faithful friend. We are one with you, Jesus the Christ, with the Holy Spirit. We are created in God’s image giving Glory to God our Creator. Amen. Responsorial Psalm 78 (Sung) . ALL: I believe in God, the creator of heaven and earth. I believe in Jesus Christ, child of God, born of Mary, human like us. I believe Jesus came to teach us God’s love, to heal our minds, our bodies, our spirit, to bring hope and a new vision, to show us how to live in the fullness of grace. I believe that Jesus threatened the establishment. Jesus called for God’s people to focus on the kin-dom within. I believe because of the message that Jesus proclaimed, Jesus was condemned to die. Jesus was put to death through crucifixion, buried in a borrowed tomb. I believe that the women, faithful to Jesus, went to the tomb to anoint his body. I believe that the body of Jesus was gone, and Jesus overcame death through the resurrection. I believe in the Holy Spirit, eternally living in our hearts, present in our world, in our universe. I believe the holy Catholic Church is the people of God gathered in worship and song. I believe that all God’s children will one day be with God experiencing life everlasting. Amen. Presider: We are people of faith. We believe in the power of prayer. We believe that we send blessings to those who are struggling and who need to experience hope; to those who are grieving and need to be comforted in their loss, to those who are facing medical challenges that they be granted hope and healing. We bring the needs of people throughout our world to our gracious God. 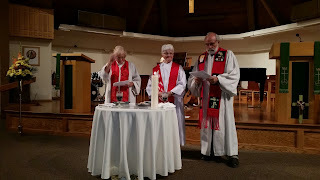 Presider: Pray my friends that as we celebrate this breaking of bread and blessing of wine we accept more fully the mission as People of God by actively living our response to God’s call. ALL: May our gracious God accept these gifts for the praise and glory of God’s name, for our good, and for the good of all the People of God. ALL: We are holy, holy, holy X3, we are whole. You are holy, holy, holy X3, you are whole. I am holy, holy, holy X3, I am whole. We are holy, holy, holy X3, we are whole. Voice 2: We ask you to enliven anew in our hearts the empowering grace of your abundant Spirit, who infuses us these gifts of bread and wine with the transforming energy of life, to nourish and sustain us in all times and especially in times of need. As we gather around this Eucharistic table, we recall God’s blessing and love from ages past, and we celebrate anew the gift we share among us at this Eucharistic feast. May the Spirit of life and wholeness, who transforms the gifts we present, transform us too, that we may be refreshed in our inner being and be empowered to bring mercy, love and healing to those whose lives we touch. Voice 5: So grant, that in union with all peoples, living and dead, we may strive to create a world where suffering and pain are diminished, where justice and peace are restored, and where all people can live in health and wholeness, united in acclaiming the God of Life, whose abundance is offered to each and to all, ‘til the Kin-dom arrives in the fullness of time. ALL: (Spoken) Our Father and Mother……. Presider: Deliver us, God, from every evil and grant us peace in our day. In your mercy keep us holy in your sight and protect us from all anxiety and fear. We watch and wait; we search and find all the signs that You are continually with us. Presider: May wonder and thanksgiving fill us, may compassion fully fill our beings, that you may heal the numbness that continues because of our society’s injustices. May you know that you are loved and may we continue to be the face of God to each other. Amen. ALL: May our gracious God, bless us all gathered here, in the name of God our Creator, in the name of Jesus our Liberator, in the name of the Holy Spirit, our Sanctifier as we care and minister to one another in love, for we are the face of God to the world. Amen. Presider: Go in the peace of Christ. Let our service continue! ALL: Thanks be to God. 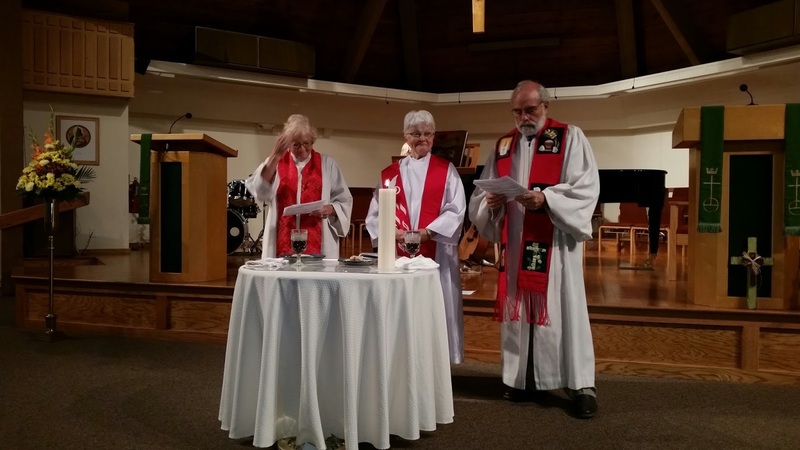 "As the United States prepares for the first visit from Pope Francis in September, the Association of Roman Catholic Women Priests is preparing to ordain three new bishops due to the growth in the movement. This peace-and-justice pope is rekindling the spiritual fire of Vatican II that has been stifled by his predecessors. There is an important question ARCWP asks him to answer when he makes his visit here: Will he put actions to his words about primacy of conscience? Pope Francis spoke about the primacy of conscience, resurfacing a Vatican II teaching that past popes have suppressed and ignored. In a Sunday Angelus address on June 30, 2013 that aired on Vatican Radio he said, "May Mary help us to become more and more ... free in our conscience, because it is in conscience that the dialogue with God is given — men and women able to hear the voice of God and follow it with decision." Pope Francis also said, "Jesus wants neither selfish Christians, who follow their egos and do not speak with God, nor weak Christians, without will, 'remote-controlled' Christians, incapable of creativity, who seek ever to connect with the will of another, and are not free. Jesus wants us to be free, and this freedom - where is it found? It is to be found in the inner dialogue with God in conscience." As ordained Roman Catholic Women Priests, we have listened to our informed consciences and have heard God calling us to be priests. On part of his tour, Pope Francis will come to Philadelphia a few days after our new bishops will be ordained there on Sept. 24. 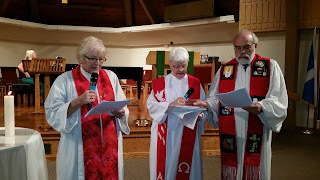 This act of ordaining women has been called by the Congregation for the Doctrine of Faith "a grave offense against the faith" and has been put in the same category as pedophilia. Women who follow their consciences by answering God's call to the priesthood are also excommunicated by the church. 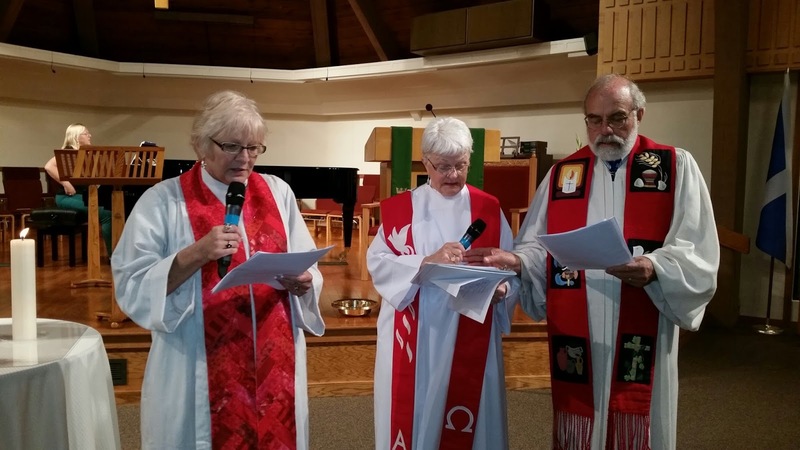 People who attend the liturgies and/or ordinations of women priests are threatened with excommunication. When Pope Francis visits Philadelphia and sees the news of the ordinations of our new bishops will he consider lifting these excommunications? If he really means what he says about primacy of conscience it would seem like a very wise and fitting action. " 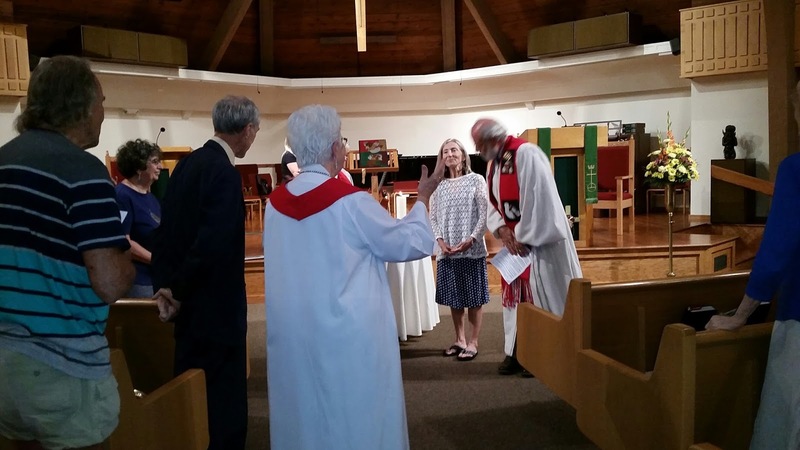 Donna Rougeux of Lexington is a priest in the Association of Roman Catholic Women Priests. As the United States prepares for the first visit from Pope Francis in September, the Association of Roman Catholic Women Priests is preparing to ordain three new bishops due to the growth in the movement. This peace-and-justice pope is rekindling the spiritual fire of Vatican II that has been stifled by his predecessors. When Pope Francis visits Philadelphia and sees the news of the ordinations of our new bishops will he consider lifting these excommunications? If he really means what he says about primacy of conscience it would seem like a very wise and fitting action.